I came home from my job . . . here in Asheville where you and I briefly met and realized that I have not read A Napper’s Companion in a while. It was a treat to read your posts all at once in the silence of my living room while my husband flipped through The Mountain Express and my Pug snored contentedly. I enjoyed all of them except the political one, but it got me thinking. I think the political system is broken, because we are. I think we should all step back and let go of our identifying with political parties so strongly and begin to really, actually listen to each other. Perhaps more healing could take place. Hmm. More for me to think about and try to do. First, Mary’s setting for reading is enchanting. Would that we all could relax in living rooms with a spouse honoring the silence and a dog snoring to provide the necessary punctuation. In fact, I don’t bruise so easily. My stay at the Johns Hopkins Writing Seminars thirty years ago gave me callouses, as did the fat file of rejection letters I’ve received from hundreds of magazines and book publishers. Mary’s except stung for an instant—a flu shot, a plucked eyebrow. The pinch was immediately followed by gratitude. I wrote back, “I couldn’t agree with you more. I’m really grateful for your note because you’ve taught me something important.” Her lesson takes some explaining. A week ago I savored the free Wi-Fi at a Panera Bread in Lyndora, Pennsylvania, and started a report about my week with kids and pastors at church camp. (You’ll get to read that soon enough if you want to.) Unfortunately, the joys of hanging out with fresh-faced teenagers and clergy friends intersected with receiving news of the nine martyrs of Charleston, South Carolina. As I sipped mango iced tea and sighed, my intended report buckled under Dylann Roof’s scowl. Rather than staying in the woods of Camp Lutherlyn, I followed the thruway to Emanuel A.M.E. Church. Soon I was dissecting the latest installment in our national shame, and the kiddos and Martin Luther’s Small Catechism were hundreds of miles behind me. 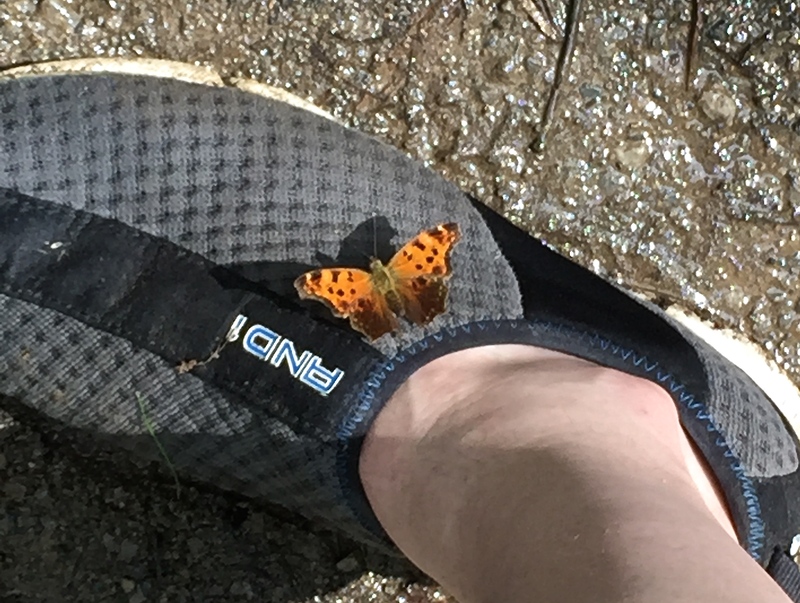 I should have stayed at camp, where a butterfly rested on my sneaker. I had a morning after experience when reviewing what I had written: “What did I do?” Even as I was droning on about a racist, terrorist attack, Mary’s except cautioned me. I should have known. Sampling around 1500 words, I felt like a cook who had spent hours on a dish that turned out bland. Eh! The fact is, writers need to be open to learning their gifts and limitations. At fifty-three I would have hoped to be confident in my wheelhouse, but since most days I squeeze in at most an hour at the writing table, awareness has been delayed. Ah well, as Sherlock Holmes said, “It is better to learn wisdom late than never to learn it at all.” Did you know that both William Shatner and Sebastian Cabot covered Bob Dylan? “Mr. Tambourine Man” and “It Ain’t Me, Babe” respectively, and others, too. The results, spoken rather than sung, were embarrassing and have been justly consigned to, well, camp. Captain Kirk seems to have embraced his inner pink flamingo. I don’t know about Mr. French. I’ve written a fair amount about societal cancers and governmental rancor and absurdity because of the effort’s therapeutic purging. But in sharing such work, I may sound like a baritone trying to tackle “Nessun Dorma.” Some measures work, but the entirety doesn’t sing. The point: Mary’s except, so gently rendered, invited me to recognize my voice, which has more to do with singing about my wife, children, grandson, and dog–close to the end, I’m afraid–than with spelling out what we humans can do to keep our species from imploding. More to do with celebration and lamentation than explanation. I enjoy having my say, but folks don’t stop by A Napper’s Companion to pick up ways to save the world. I imagine if you’ve hung around here for long, you’re like Mary from Asheville, reclined in a quiet room with a sleeping Pug. You’re looking for a few minutes of hope, a port of joy or comfort in all kinds of weather, or a love letter. our common life declares our ills. and lead us to it. A song and a prayer aren’t much, I know, but they’re all I’ve got. This post had within it a gentleness, humility and wisdom that resonated with me and at the same time accused me John. You have inspired me to explore and grow, and maybe even write something of my own in reply. Maybe, John. I’ve stopped looking anywhere for “explanations” or answers. The only answer is love, and you write about that beautifully. However – in the lamentation category – it is good to find company in the suffering and hear others echoing the same unanswerable questions. I don’t know just what you drafted, but I think that sharing the journey with others is helpful not only as therapy for you, but as company for us. My two cents. Speaking of love, is that Mary’s pug or your pug? Precious! Your song and your prayer are more than enough. p.s. I love the mango iced tea at Panera. Well, you know, doc’s orders are always negotiable. Har har. John, I loved this posting. It gave me food for thought, and at the same time, brought me comfort. Like another of your followers posted, I struggle with the broken politics of our country and the horrors taking place in the world. I think perhaps the best I can do is continue to attempt to love my neighbor and be the hands and face of Christ in my small corner of creation. And that, my friend, is a difficult undertaking. Your blog is a source of encouragement. PS. That is not Bucky, my Pug, but they do look a lot alike. He is now snoring in his little bed under the table, because, after all, being an Earthly example of unconditional love all day can be tiresome.